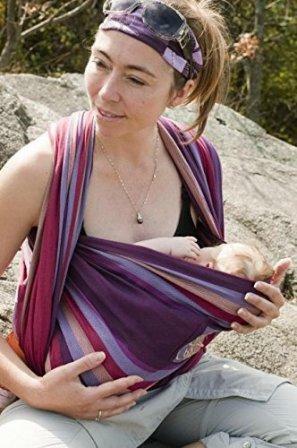 A woven wrap is a simple piece of woven fabric that is wrapped around you and your baby. It is a long piece of cloth that is used to carry your baby. It is made of varieties of fabric and blends such as cotton, linen, hemp, wool, bamboo and silk which are woven on a loom by hand or machine. It can be used from day one when your baby is born until they become a toddler. Most manufacturers recommend the woven wrap to be used from birth to 40-45lbs. The size of the wrap you need depends on your body size and which position (front, back & hip) you need to wear your baby. Many people choose a wrap which they can use to tie front wrap carry cross and tie behind your back referred to as your base size. 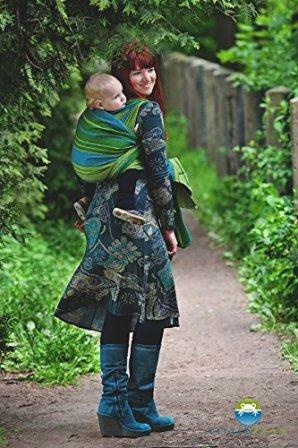 If you are looking more of babywearing products, have a look at our reviews of various products. For you to know the correct size of a woven wrap, you need to know your T-shirt size(s, m, L, XL, XXL, 3X). It is measured in meters commonly referred to in sizes. 2.7 meters woven wrap is Size 2 – very small and can be used as a scarf. 3.1 meters woven wrap is Size 3-. 4.2 meters woven wrap is size 5- best size for those wearing S or M t-shirts. Size up if you are carrying a toddler. 5.2 meters woven wrap is size 7- if you weigh more than 180lbs, have broad shoulders and large breast this is the best size for you. Also, best size those wearing XL or 2X t-shirt size. 5.6 meters woven wrap is size 8- best for those who wear 2X or 3X t-shirts or dress size 22US/24UK or larger. Most stretchy wrap brands come in one size that fits all, and that is size 7 or 8. A woven wrap is woven on a loom using hand or machine and has no stretch length or width while stretch wrap has a lot of stretch on them. Stretch wrap comes in plain color, one size that fits all (around 5.5 meters, between a size 7 and size 8) while woven wraps have different sizes (explained above) and are colored. 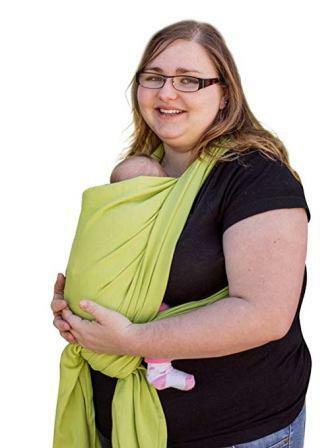 Stretch wrap can be used in hip and front carries but not for back carries suitable only for few first months of your infant while woven wrap can be used for back, front and hip carries it ideal for newborns and toddlers. Stretch wrap are not supportive to carry heavy babies comfortably meaning they have limited lifespan while the woven wrap is made of sturdy material makes them be able to support much more baby weight. Stretch wrap is easier to use it can be pre-tied before the baby is in while woven wrap cannot. Cotton- best for any baby age, affordable, best for the first-time wearer and soft. Linen- best for toddlers and hot weather because are thin and breathable. Some linen wraps are blended with other material such as cotton. The linen woven wrap is not best for first-time wrappers. Wool- soft, breathable but not comfortable to maintain. Hemp- is most expensive, thicker than linen, and best for heat during summer season. Silk – woven wrap made of silk are tricky to buy. Make sure its thickness and weight are appropriate with the weight of the baby you are carrying. Thicker silk is best for carrying a toddler comfortably. Look for much thicker silk wrap as your baby add weight if not it will start digging on your shoulders. They are soft and easy to maintain hand wash in lukewarm water and hang out to dry not direct sunlight. You can throw it into the washing machine. Bamboo- they are soft and hypoallergenic making them best for the newborn sensitive skin. 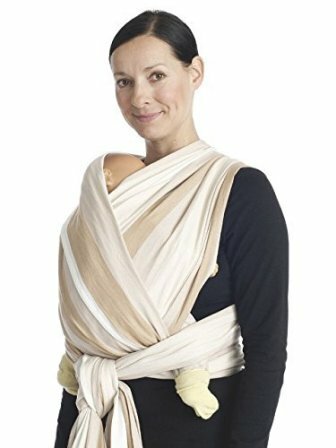 The bamboo woven wrap is frustrating to tie appropriately not best for first-timers. Blend – this is woven wraps made of a combination of more than one material. Others are made of recycled material such as water bottles, Eucalyptus pulp, and recycled fabric scraps. The thickness of the woven wrap is measured in weight – Grams per meter squared (g/m2). 220 – 260 g/m2- medium best for new wrappers. Thick and very thick best for the person who is used in wearing. They can be harder to tighten the knot and also the knot can be enormous to work. Woven wraps are the best way to wear your infant all the way toddler years. Following the above guide, you will be able to get the right woven wrap for your baby. 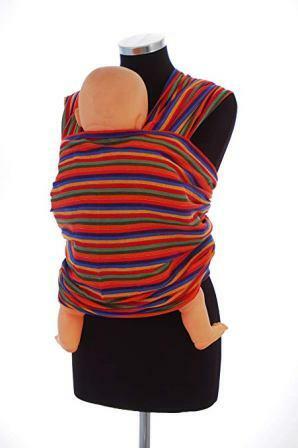 This woven wrap is easily adjustable to be used for front, back, and hip carries for infants through toddlers. 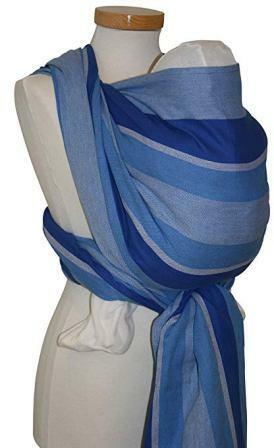 It is made of cotton which is hand-loomed, breathable fabric with a top quality aluminum ring sling. 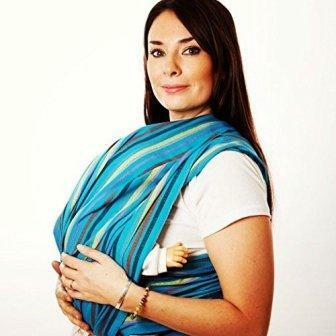 Lightweight fabric makes it easy for Hip Baby Wrap Ring Sling cooler for baby, easy to manipulate and ergonomic design helps distribute baby’s weight evenly and comfortably across caregiver’s body, relieving the shoulders and neck from unnecessary strain. 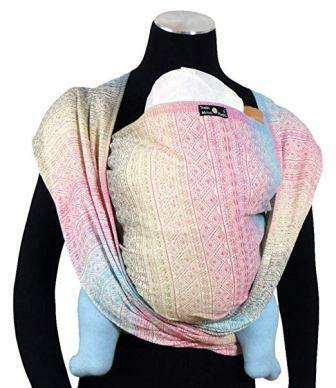 The Hip Baby Wrap Ring Sling is individually hand woven with eco-friendly non-toxic dyes. Therefore, each wrap is unique and beautiful. It is suitable for babies 8-35lbs, adult size 2-12 and size six dimension 185 by 28” inches. 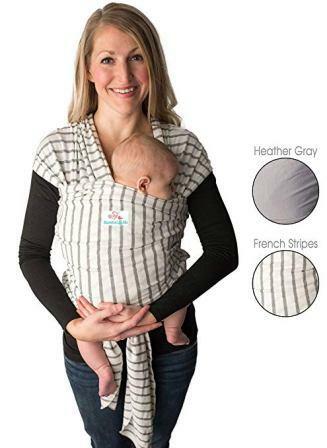 3-in-1 baby wrap that can be used as a carrier, nursing cover for breastfeeding and blanket to keep baby comfy. Made of cotton and spandex blend makes easy for Bambini & me woven wrap easy to wash even after baby drools, spit up and diaper leaks mess. The fabric is also machine washable and soft on baby’s skin. Beautifully woven wrap using organic cotton using only safe non-toxic dyes. The fabric is soft on the baby skin, easy to tie, tear proof and resistant. It comes in a different size that fits all ages and baby stages from newborn to pre-school age. 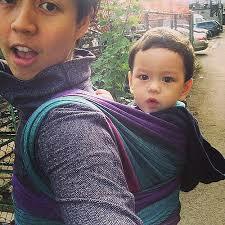 The DIDYMOS is a most versatile baby carrier with many different tying options for FRONT, HIP and BACK CARRIES. The Ellaroo Woven Wrap Baby Carrier is made of hand-woven cotton makes it lightweight and great for all carrying positions (front, side, back and facing in or out). It is suitable from birth to 3-years weighing 8-40 pounds and wide enough to distribute weight across both shoulders for long carrying comfort. The wrap is 27 inches wide and 5.0 m large up to 190lbs and 6 inches. The Chimparoo Woven Baby Wrap which is easy to tie. This wrap is adaptable to different body type wearers and suitable for children of any age regardless of child weight. This product is made of organic cotton dyed with non-toxic dyes in beautiful colors making it machine washable. It provides comfortable full-torso weight distribution for the front, back, or hip carries and ergonomic support to parent and baby. The Green Miel et Malice is suitable for babies from birth through years. Made of organic cotton which makes Dolcino Woven Ring Sling machine washable. The Non-stretch woven yarn dyed according to IANT standard and holds babies from 8lbs up to 60lbs. The Storchenwiege Baby Wrap is made of (Organic) Woven Cotton.